Sunday is going to be a good day for sleeping in. Yes, the biannual changing of the clocks is upon us. Many in North America will gain an extra hour when daylight saving ends Nov. 3, and time falls back one hour, meaning you’ll have an extra hour to do whatever you wish this weekend. With the end of the daylight saving, which took effect this year on March 10, participating countries will return to standard time. By shifting the observed time forward in the spring and back in the fall, territories are able to maximize the hours of sunlight available during regular daytime hours. BEST RACING, LIVE MUSIC & MORE! Witness first-hand 147 screaming decibels from the most impressive racing machines in the world as they accelerate from zero to 100mph and back down to zero in five seconds flat. And after the races, stick around for concerts at Austin360 Amphitheater and Sunday’s Fan Track Invasion. The fun doesn’t end at the track! Every night, downtown hosts Austin Fan Fest–a 12 block, four day, Grand Prix after-party with live music on 6 stages…all for FREE!! Also dont forget the Austin Fan Festival going on downtown Thursday Nov 14- Sunday Nov 17. Six live music stages featuring great artists including Andy Grammer, Berlin, Lou Gramm, Everlast, Los Lonely Boys & more! Go to http://austinfanfest.com/ for a complete schedule of events. October brings in the Halloween season and for Central Texas, that means Haunted Houses. Austin has a variety of Haunted Houses – some of them we know well, others not so much. Below is an up to date list of all the haunted houses in and around Austin for you to enjoy. The House of Torment has been operating in Austin for a long time. If you haven’t been to it before, you probably know someone who has. Currently, the House of Torment has three separate haunted houses in one massive location up at the Highland Mall. Their shows include Slaughterhouse: The Harvest offers you a country style scare, Blackthorne District gives an asylum twist full of experiments gone wrong, and Cursed: Ancients Emerge, which unearths the guardians of the Realm of Torment. You can check out all of the attractions information on their site. The HOT is open every day in October from 7:30 – 11:00 with hours extended on Friday and Saturday. The Scare for a Cure is an organization that utilizes a volunteer staff to organize haunted events and a unique interactive adventure of terror in Manor, TX. The shows include the Little Red Riding Hood-themed Fairy Tale Nightmare, the old west-themed Murder at Ghost Town, and cemetery-themed, Boneyard. Their main attraction is called Quest Night, an interactive medieval adventure where participants get to battle giant spiders and zombie warriors. They only allow groups for this event. Tickets are available for all shows every weekend in October leading up to Halloween and profits from their shows are donated to local cancer related charities and organizations. Visit their site for specific details. Night Terrors is “the realism haunted house that will shock you to the core”, according to their website. On their Facebook page, Night Terrors urges customers not to confuse them with that “Highland Mall Disney show”, House of Torment. Those are big words. Reviews online suggest that Night Terrors has the stuff to back it up, but you’ll have to see for yourself. Located off of 183 just north of McNeil Drive, Night Terrors isn’t too far from the House of Torment. Their assortment of scenes and scares features two spooky clowns, Lunatik & Gzmo (pictured below). Night Terrors is open every weekend in October from 7 – 11pm with tickets ranging from $20 to $34. Visit their website for more information. You’ve probably seen the Austin Ghost Tours trolley car rolling up and down 6th Street and wondered what ghost stories Austin has to its name. Based on classic ghost stories about Austin and recent investigations into the paranormal, the Austin Ghost Tours is the real deal, taking visitors on several walking tours as well as the trolley adventure. You can visit haunted sites like the Capitol Building, the Warehouse District, and the Driskill Hotel. Prices for different tours can vary so please visit the site for more details. The majority of the year, Pioneer Farms is a living history park used as an educational tool for children. But during Halloween, they open up the haunted trails of Sprinkle Corner Village, where families and kids search for hidden magical symbols left behind by the Ancient Brotherhood of the Golden Light to prevent the Powers of Darkness from ripping open a gateway “that would permit evil to gain foothold in the mortal world” during the harvest season. Quite the narrative! The Quest of the Haunted Trails is only open four nights this year: October 18-19 and October 25-26 from 7-10pm. Admission is $12 per person. Visit their website for more information. If you’re looking for a more independent Halloween experience, below is a list of the five most haunted places in Austin as listed by Fiona Broome, one of Austin’s most prolific chroniclers and writer of Austin ghosts and hauntings. They’re not full of scares (depending on how you feel about 6th Street), but they might be fun spots to enjoy a cool October night. • The Driskill Hotel • Buffalo Billiards • The Spaghetti Warehouse • Texas Capitol Building • Oakwood Cemetery and Oakwood Annex Cemetery on Navasota St.
Viva La Vida Festival, Saturday, October 19, from 2 – 10 p.m., Mexic-Arte Museum. This year, the Museum will present the 30th Anniversary of the festival with the debut of 100 Catrinas during the Grand Procession and a reunion call to all Austinites who have participated over the years. The free annual street festival is Austin’s largest and longest-running Day of the Dead event and features a Grand Procession, Latino artists and entertainment, an exhibition with community altars inside the museum, and educational programs. Attendees will also enjoy traditional foods from local food trucks, hands-on art activities, artist demos, and traditional and contemporary Latino art. The 2013 event is co-sponsored by the City of Austin. Festival: 5th St., between Congress & Brazos, 2-10 p.m. Grand Procession: Line-up on 6th Street (between Comal and Chicon) 5 p.m., runs down 6th St. to 5th & Congress, 6-7 p.m. FREE. Goblins in the Garden, Sunday, October 27, 4 – 7 p.m., Lady Bird Johnson Wildflower Center. Dress up and come to the Wildflower Center and trick-or-treat at candy stations throughout the garden. Kids can also get their faces painted, listen to stories at the Little House, take part in a scavenger hunt, do arts and crafts, and march in a costume parade. Admission is $9 for adults, $7 for seniors and students, $3 for children 5 through 12, and free for Center members and children under 5. HalloweenFest, Thursday, October 31, 5 – 9 p.m., Downtown Bastrop. Take the family down to historic main street in downtown Bastrop for the Annual Halloween Festival, recognized as one of the top Halloween festivals in the country. Kids and parents alike will enjoy costume contests, pumpkin carving contests, trick-or-treating, games and more. FREE. 11th Annual Boo-da Halloween, October 26, from 5 – 9 p.m., Downtown Buda. Downtown Buda serves as a safe and fun opportunity for children to trick-or-treat for Halloween and includes Halloween stories, crafts, games and more Halloween fun at the Buda Public Library. FREE. Little Gym Halloween Bash, Sunday, October 27, 3 p.m., Little Gym Round Rock. Ghostly games, thrilling treats, and a mysterious maze! Costumes are encouraged! Please call at 512-687-4141 if you have any quivering questions! The first gym play hour from 3:00-4:00 p.m. is only open to families with children under 3 years. Families with children 3 years and older will be invited to come at 4:00pm. Children under 3 years are free to stay after 4:00 p.m. If you have both Parent/Child and Pre/K children, please do not participate in gym play before 4:00 p.m. The Halloween Bash is open to EVERYONE! You do not have to be a member to attend, so invite friends and family! Admission is FREE. The Little Gym of Round Rock, 3203 S IH-35, Round Rock. You may also be interested in Pumpkin Patches in Austin and Beyond. South by Southwest may not officially hit town for another five months (now that Eco’s done), but the emails have already started trickling in: Buy your pass! Book your hotel! And now, here comes the first wave of programming. • Nine “feature sessions” are already on the books, including everything from “Generation Mash-Up: Y Bother?” from Mashable honcho Pete Cashmore to a conversational session with Assassin’s Creed co-creator Jade Raymond about games’ impact on the environment. • Security and privacy, on everyone’s minds and fingertips since the Edward Snowden leaks this summer, will receive their own track of programming, to be hosted at the Sheraton Hotel. • Space-related programming, which launched to great success last year, returns, with folks from NASA talking everything from climate science to life on other planets (presumably in case we flub the climate science bits). • Emoji get their day in the sun, as Vocabulary.com’s Ben Zimmer discusses the death of language. • The Texas Tribune will talk about their big win on the night of Wendy Davis’ filibuster, as “Streaming Politics Beat TV” – by a long shot. • Chris Trew talks about “The Humor-Centered Design Process,” and you should probably listen. Man knows a thing or two about laughs. But speaking of humor, xoJane’s Jane Pratt is back this year, this time to talk about the humor gap online. • Everything in the Intelligent Future track suggests our childhood dreams of a Jetsons reality may finally be on the horizon: Driverless Cars, Hardwiring the Brain, smart apps, gesture-controlled electronics, and more. • “Hacking Meat: Why Insects Are the Future of Food.” Whoa, what? You can read the full list over at the SXSW website. Another 300 or so panels will ultimately make their way to the calendar, so stay tuned for more if none of these (seriously?) strike your fancy. Weekend two of Austin City Limits will take place this weekend in Zilker Park, and a number of the performances will be streamed live on the festival’s website. You’ll be able to watch sets from The Cure, Atoms For Peace, Depeche Mode, Kings of Leon, Muse, Queens of the Stone Age, Arctic Monkeys, Kendrick Lamar, Lionel Ritchie, Phoenix, Wilco, The National, Vampire Weekend, Passion Pit, Divine Fits, Local Natives, Dawes, Toro y Moi, Savages, Okkervil River, Parquet Courts, and Portugal. the Man, among others. Check out full schedule below (note: all times in CDT). Tipsters, readers, friends and family of Eater Austin always want to know: Where should I eat right now? What are the buzziest new restaurants? What haven’t I heard of? What’s everyone talking about? 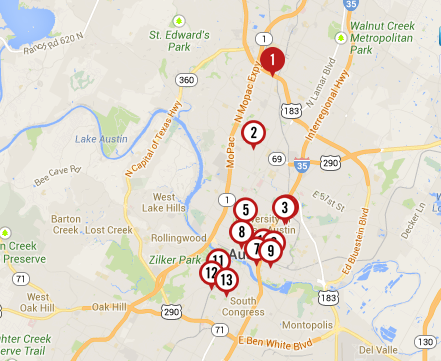 To answer those questions, we present our 28th edition of the Eater Austin Heatmap. On the list are four hot new restaurants: Black Sheep Lodge’s new sibling Haymaker; Hotel Ella’s restaurant Goodall’s Kitchen & Bar; coffee bar and craft beer pub Wright Bros. Brew & Brew; and the second outpost of Lucy’s Fried Chicken on Burnet Road. The long-anticipated Cherrywood neighborhood pub from the Mi Madre’s and Zanduga team features a bar-snacks focused menu, speciality cocktails and local beers. Even better, there’s nothing on the menu over $10, and the cocktails are reasonably priced, too. This Manor Road comfort food spot from the brains behind Black Sheep Lodge has all the makings of a hit. A huge wall of taps? Check. 13 screens during football season? Check. Poutine? Not one, but two kinds. They serve big, gravy-covered sandwiches, too. Not technically open until Saturday October 5th, Goodall’s is hoping to foster a “neighborhood atmosphere” at the new Hotel Ella, in the former Mansion at Judge’s Hill space. They will serve breakfast, lunch, and dinner, as well as a Sunday brunch. Qui is not a hot restaurant. Qui is the hottest restaurant. The most anticipated opening of the year, Qui is Top Chef winner Paul Qui’s east side flagship, the first all-Qui all-the-time locale where he’s really been able to stretch his culinary legs, with a constantly evolving menu that features seven preparations of rabbit, a gorgeous Wagyu steak to share and a mind-blowing “Ode to Michel Bras” cold soup. But part of Qui’s genius is his decision to surround himself with other brilliant people, like front-of-house maven June Rodil, assistant GM Bill Man, and chef consultant Tim Dornon, though bar manager Michael Simon has already left the scene. “The Next Food Network Star” alum Brad Sorenson brings “homespun twists on upscale classics” and clean, modernist-inspired design to Rainey Street. Dinner is the focus, with a late night menu offered as well. When Haddingtons shuttered, ELM Restaurant Group (24 Diner and Easy Tiger) stepped into the space with this airy French-inspired restaurant. And this place has everything: a reasonably priced, $25 three course prix fixe, a bread program courtesy Easy Tiger, a cordial cart, and a wine list from master somms Craig Collins and Devon Broglie. All of Austin is buzzing about this new coffee shop and craft beer pub in the former Progress space on East 5th. They are also serving breakfast, sandwiches, and bar snacks. Chef Daniel Olivella’s Austin outpost of his Barlata Tapas Bar stands to be one of the most popular spots of the summer, as the NoCal chef introduces Austin to the brilliance of his authentic Spanish tapas menu. Local brewery Austin Beer Garden and Brewing Company makes good with an actual beer garden, featuring their own brews and a locally-sourced menu of pizzas, sandwiches, and salads. The soft opening generated lots of buzz before their opening in late August. The Tran family, who own the popular Hai Ky restaurants, has branched out into Spanish cuisine with their new South Austin tapas and wine bar. Bar snacks and larger tapas plates round out the menu.